Last week, some co-workers and I traveled to Columbus, Ohio for the National Extension Association of Family and Consumer Sciences. I returned with a lot of wonderful ideas, a collection of knowledge, and an acorn squash. Yes, I went to the North Market in downtown Columbus, home of fabulous fresh produce, baked goods, international foods and more, and eyed an acorn squash that I knew I had to take home with me. Now I know I can get an acorn squash in central Illinois, but this one was conveniently right in front of me and since I know it travels well, why not? 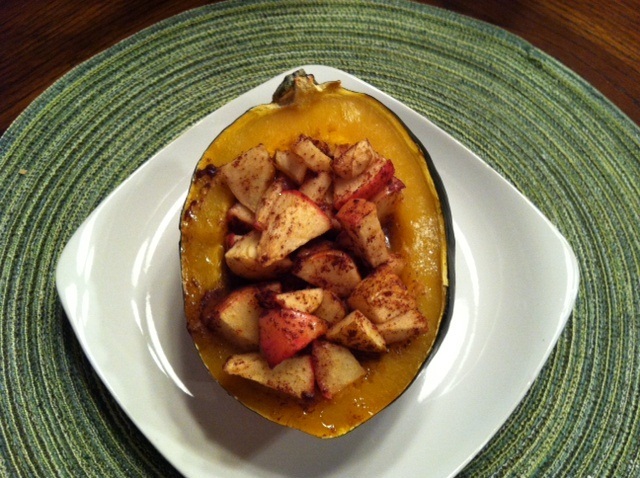 My husband and I have a favorite fall recipe that uses acorn squash and apples. If you've never had acorn squash before, let me introduce you to this wonderful vegetable. Acorn squash is considered a winter squash, and the most common variety has an acorn shape and dark green color with random orange splotches. If you have children, take them with you to the store and have them pick it out. (Remember, when kids have a hand in the shopping and preparing of food, they are more incline to eat it!) Many pumpkin farms will sell acorn squash so if you're picking out a pumpkin, be sure to bring home a squash, too. Once you're home, preparing it is simple! It can be baked, broiled, or even microwaved. Since the squash is very hard, you will need a sturdy knife to cut into it, slicing it in half from top to bottom. Be careful! I recommend piercing it a few times and them microwaving it on high for 2 minutes. Allow it to cool to touch, and then you can carve into it with ease. Don't worry about peeling it; the ribbed shape makes that virtually impossible. Most of the time acorn squash is served in its shell, and it can be stuffed with rice and meat or fruit and vegetable mixtures. Once it's cooked, it's very easy to scoop the flesh away from the skin. Try this delicious stuffed acorn squash recipe. It's so sweet it can even pose as dessert! To save on time, try microwaving it instead of baking it in the oven. Simply microwave the two squash halves on high for 5 minutes (no water needed). Add the apple mixture and continue to microwave on high at 5 minute intervals until squash and apples are tender. You can even save the seeds and roast them to have as a nutritious snack. Simply wash the seeds, and pat dry with a clean towel. Sprinkle with 1-2 tablespoons of olive oil and a pinch of salt to season them if desired. Place in a single layer on a baking sheet, and bake for 15-20 minutes in a preheated oven at 275°F. Stir the seeds every 5 minutes to prevent them from browning. Enjoy! Preheat oven to 400°F. With a large chef's knife, split acorn squash in half from top to bottom. Spoon out seeds and discard or save for eating. Place face down on a baking dish filled with a quarter inch of water to prevent squash from sticking and burning. Place in preheated oven for 25 minutes. In a medium bowl, mix apples, melted margarine, syrup and cinnamon together. Spoon mixture evenly into two squash halves. Bake apple-stuffed side up for an additional 35 minutes or until squash and apples are tender with a fork.